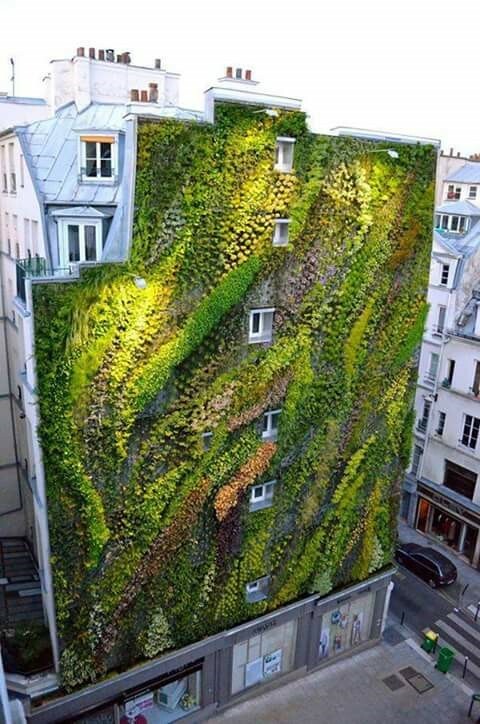 The benefits that vegetation brings to buildings are multiple when it is integrated in an appropriate way. 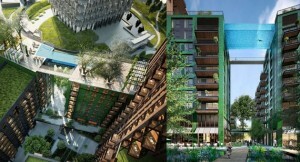 The vertical gardens in the enclosures of the buildings or vegetal covers are example of it. 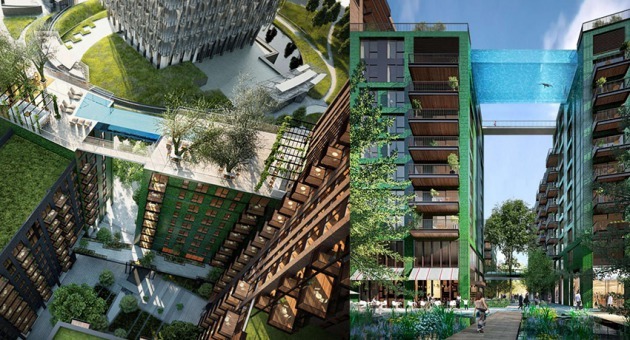 These systems intervene in the bioclimatic behaviour of buildings improving their performance. Vegetation improves the quality of the buildings integrated both inside and as part of its enclosure. Improves its energy efficiency among other benefits. But in addition the vegetation integrated in the buildings improves the environmental and visual quality of the buildings, increasing the surface destined to green zones. The vegetation therefore provides environmental benefits but also social and economic benefits. On the other hand, vegetation also improves the environmental quality in the cities since, among other benefits, it mitigates the urban- heat island effect by reducing the temperature in its surroundings. The solar radiation is absorbed by the plants, substratum, and is not stored in building materials, thus regulating the local climate. The vegetation also reduces the environmental noise inside and outside, obtaining quieter environments. In interior spaces it can reduce up to 10 db, but the level of acoustic absorption will depend on the type of plant chosen. In urban areas they reduce noise pollution, since they absorb noise from vehicles and other elements. They also prevent the bounce of sound waves on the surface of the facades of the building. They act therefore as acoustic screens. The vegetation captures and regulates rainwater and its runoff. The vegetable covers are a clear example of this. 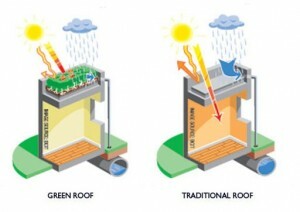 This roof system retains rainwater. Subsequently evaporates and the rest is gradually evacuated. And as a consequence, the overload of water transported by municipal sewer systems and also overflows are reduced. The vegetation integrated in the enclosure of the building provides additional thermal insulation, protection from solar radiation and regulates the temperature. Both vertical walls and sloping roofs. During the winter it protects from wind and humidity. However, in summer, it protects against excessive heating of interior spaces by blocking solar radiation. In dry climates the vegetation integrated in the architecture humidifies the environment by cooling the air between 1ºC and 5ºC. The explanation is that the vegetation expels moisture in the process of photosynthesis absorbing heat. In any of these situations, vegetation improves the energy performance of the building by reducing its consumption in heating and cooling. The vegetation absorbs the fine particles pollution. Polluting products such as nitrogen oxide, sulphur oxide and particles in suspension. In this manner, vegetation favours the process of air purification and the creation of healthier environments. For example, 1 m² of plant cover traps 130 grams of dust per year, and a 4-storey building with a plant front filters 40 tonnes per year of harmful gases, and traps and processes 15 kg of heavy metals. In addition, the presence of vegetation allows the absorption of CO2 and the generation of oxygen through photosynthesis. One square meter of plant cover generates the necessary oxygen for a person in a year. The vegetation can protect from atmospheric agents such as ultraviolet radiation or air pollution. In this sense it can increase the durability of the materials of the enclosures in which it is installed. By increasing the durability of materials it is possible to reduce maintenance costs by guaranteeing the proper state of preservation. On the other hand, vegetation adds value to the property because, in addition to improving its thermal behaviour, it also gives it a pleasant appearance, improving its visual quality. The buyer of this type of building positively values the reduction of the building’s energy consumption and is aware of the protection of the environment. 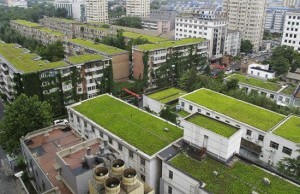 The presence of vegetation on roofs adds sun protection but also additional thermal insulation. The substrate itself of the vegetation cover already collaborates in improving the energy efficiency of the roof due to its thermal properties. If we value the thermal insulation capacity provided by the vegetation in an additional way, this will depend on whether it is an extensive or intensive cover. Posted in Architecture Marbella Costa del Sol News and tagged with vegetation garden bioclimatic benefits energy saving marbella architecture .